Mayor Eric Brewer on "Meet the Bloggers"
Submitted by Norm Roulet on Sun, 04/30/2006 - 12:05. 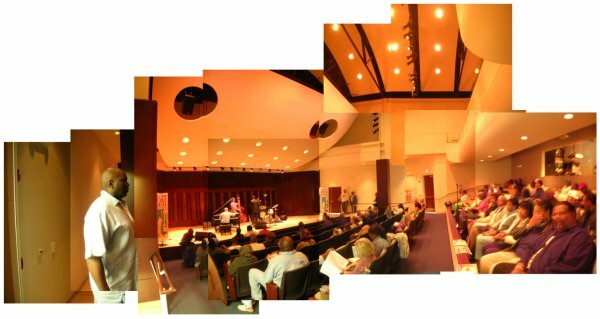 Saturday and Sunday, April 29 & 30, 2006, the Tri-C JazzFest took the spectacular stage at the East Cleveland Public Library, custom built for jazz by world-class library leader Greg Reese, for two major FREE concerts that drew full house crowds to a community few know and so most don't appreciate. After this weekend, many more people understand East Cleveland is the coolest city in NEO. No doubt the music was first class - I'll save review of that to the experts. My observations are on the transformational impact of one man - Greg Reese, who was individually responsible for leading the charge to make this East Cleveland library facility one of the best music venues in the region and one of rht best libraries in the country - I am awed by the impact of one world-class facility and leader on a community. The East Cleveland Public Library has set an example for public libraries that must turn to private donors and foundation grants to protect the quality of library services. Reese relied on his relationships within the community to coordinate a campaign that prospective donors could not overlook. Highly respected architect Richard Fleischman agreed to design preliminary expansion plans with payment dependent on funding. Cleveland Foundation became the first organization to agree to support the project by donating $1 million for the project. Other donors signed on to support the project after the Cleveland Foundation's initial donation, including the George Gund Foundation, which donated $250,000 and an additional $46,000 for a consultant to assist Reese with securing additional funding. Morton November donated $250,000 in memory of his daughter, the namesake for the Debra Ann November Wing of the East Cleveland Public Library. Sunday, East Cleveland exceeded capacity! Submitted by Norm Roulet on Mon, 05/01/2006 - 08:19. The Sunday, April 30, free JazzFest concert at the remarkable East Cleveland Public Lbrary was full beyond capacity, with scores of people turned away, as NEO proves there are plenty of people who love to come together in special places like East Cleveland to share in the special experience of arts appreciation - this is a stunning example of community building that must be supported further and expanded... I'm ready for the next beautiful afternoon in East Cleveland, surrounded by great local genius in music... bring more on! Submitted by KMaCK on Tue, 05/09/2006 - 22:50. My husband and I were among the lucky ones that got into, yes full house, at EC Libarary for one of the two free jazz concerts. It was the first time that we made it. As I understand it, East Cleveland Public Libary has been having several of these concerts, just rather sporadically. What I was most pleased to hear from Mr. Reese was that this past weekends event was the inaugaral event for a planned series of concerts to be called (I believe) "The Debute Series". KUDO's - HAT'S OFF - A GREAT ROUND of APPLAUSE!!! And what makes me even more proud is that we can say we are actual residents of EC, so it makes us real proud that we get some POSITIVE news about out little community. Submitted by Norm Roulet on Tue, 05/09/2006 - 23:15. I've have the pleasure of working with many East Cleveland leaders and supporters so I see positive things there every day, but it isn't often the eyes of the world are centered on such a lovely event and facility there - thanks to everyone who helped make this possible... I look forward to more in the series. BTW, speaking of great East Cleveland cultural institutions needing love, the East Cleveland Community Theater is planning for the future, and has formed a Friends of the East Cleveland Public Theater. More to post on this shortly - contact me at norm [at] realinks [dot] us if you want info in the mean time. Submitted by Susan Miller on Sun, 07/02/2006 - 16:15. With a fresh diploma from Morehouse College in 1975, Greg Reese, a Cleveland native, needed a job. Although he studied history, a friend steered him toward the library. The trial by fire that was his first library job would have sent most people running in the opposite direction. That was nearly 31 years ago. Along the way Reese received his Master of Library Science degree from Case Western Reserve University, finishing the program in 10 months. He is now Executive Director of the East Cleveland Public Library, for which he has raised nearly $4 million from 40 foundations, corporations, and individuals to create a new wing and a state-of-the-art performance facility. “My library is the most important institution in my community,” he said. To wit, the library does everything from tax preparation to hosting national jazz acts, from teaching computer skills in its labs to providing a new space for the Black Heritage Collection, a collection of print and non-print materials created by African Americans, including artifacts and literature collected by Icabod Flewellen, founder of Cleveland’s African-American Museum. Reese’s passionate interest in jazz—he’s the author of JAZZKEEPERS, A Pictorial Tribute & Memoir—fuels the partnership between the library and the annual Tri-C JazzFest. “He believes, as do we at the JazzFest,” says Beth Rutkowski, managing director of the JazzFest, “that this community deserves the best that the arts world has to offer.” Look for more national jazz acts in the future in the Greg L. Reese Performing Arts Center. This prize will be awarded annually to an exceptional individual who has shown passionate leadership and opened his/her field more broadly, and whose life and activities communicate the joys, excitement, and deep human relevance of the arts. This prize is open to national/international candidates. Recipient must be present for the awards event. Only two other's have recieved the Bergman Prize-- Bill Rudman http://clevelandartsprize.org/bergawardee_00.htm and Robin Van Lear http://clevelandartsprize.org/bergawardee_01.htm. Bergman Prize winners are given a ring designed by Cleveland luminary John Paul Miller http://clevelandartsprize.org/visart_1961.htm who recieved the Cleveland Arts Prize in its inaugural year -- 1961. Submitted by Norm Roulet on Mon, 07/03/2006 - 01:18. There is no doubt Greg Reese is much loved in East Cleveland and everywhere in NEO he is known, and this prize seems to fit his accomplishments as Director of the East Cleveland public library perfectly - "an exceptional individual who has shown passionate leadership and opened his/her field more broadly, and whose life and activities communicate the joys, excitement, and deep human relevance of the arts". I hope all this prizing and praising doesn't attract too much attention and draw him away from East Cleveland, where his impact has been immeasurable. Here's to many more years of success for Greg in the city where he is much loved! Outsiders, connect with him but please don't try to steal him. I - we love you Nan! Where are the 990s for Cuyahoga County Land Reutilization Corp?